Volunteers walk across the field at the Central Texas State Veterans Cemetery on Sunday, Jan. 5, 2014. More than 5,000 wreaths were to be removed. 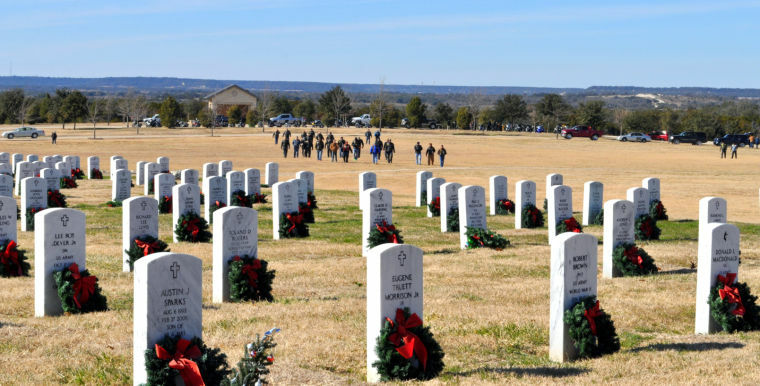 Amidst a sea of white headstones, more than 400 people collected Christmas wreaths Sunday afternoon during the culminating event of the eighth annual Friends of the Central Texas State Veterans Cemetery’s Wreaths for Veterans project at the cemetery. Despite the bitter cold wind, Sgt. 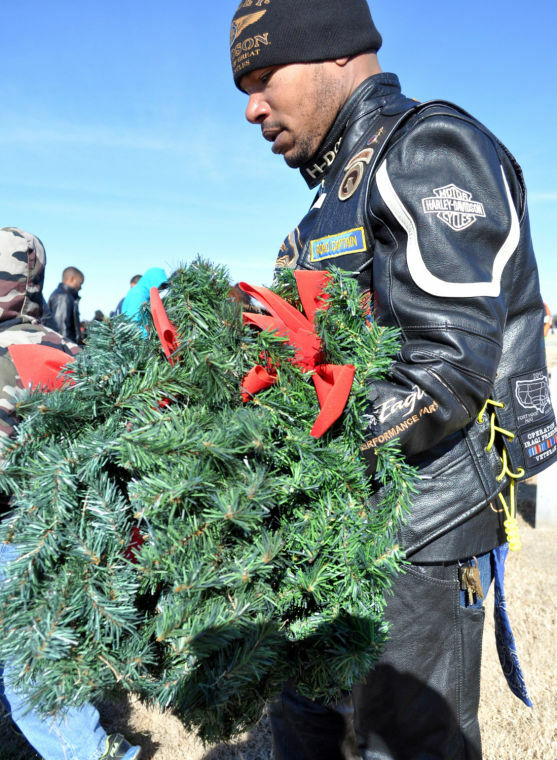 Secoya Allen, 4th Sustainment Brigade, 13th Sustainment Command, happily gathered wreaths alongside fellow members of the nonprofit motorcycle club, Unleashed Beasts. Local motorcycle groups are active in community service, said Amy Shores. She is a member of the Queens of Sheba, an all-female motorcycle club. “We come out here every year. Many of our members are military veterans. It’s a beautiful thing,” Shores said of the community support for the military. 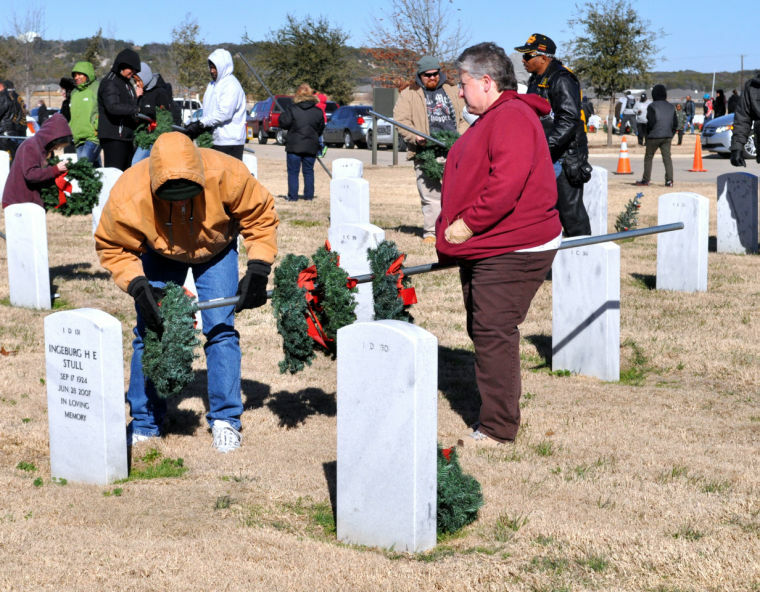 Killeen Veterans Cemetery Wreath Removal Ceremony 2014 Video! Two volunteers remove a wreath from a grave at the Central Texas State Veterans Cemetery on Sunday, Jan. 5, 2014. Sgt. Secoya Allen with the 4th Sustainment Brigade, 13th Sustainment Command, removes a wreath from a grave at the Central Texas State Veterans Cemetery on Sunday, Jan. 5, 2014. 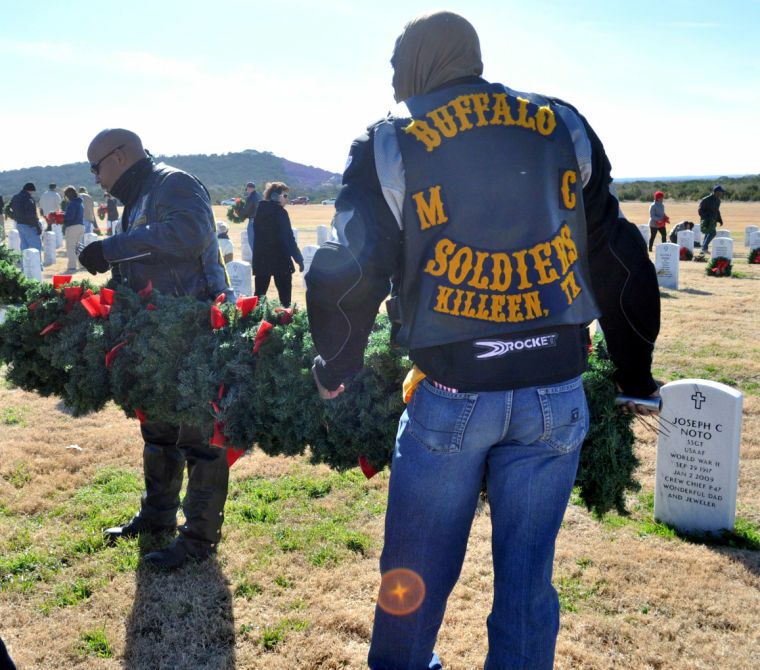 Members of the motorcycle club, Buffalo Soldiers, help remove wreaths from the Central Texas State Veterans Cemetery on Sunday, Jan. 5, 2014. Two volunteers carry a pole filled with wreaths at the Central Texas State Veterans Cemetery on Sunday, Jan. 5, 2014. 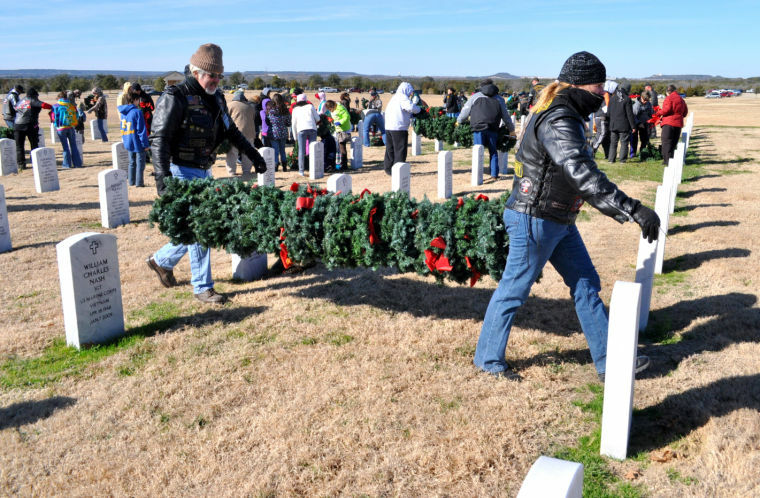 Some 5,000 wreaths that adorned the graves of veterans were removed.